SOLID STATE ELECTRONICS CO. PVT. LTD.
6. Silicon Carbide Rectifier Diodes & Bridges . Silicon Carbide Rectifier Diodes & Bridges - Single and Three Phase Download file in pdf format. Fast Recovery Download file in pdf format. Electric Vehicle with Power Electronics (Automatic) Transmission in 1974. Solid State Electronics Co. Pvt. Ltd., incorporated in March 1971, has been synonymous with Power Semiconductors for almost 4 decades now, under the SSE Brand Name. Production began at small factory in Worli, Mumbai that same year. 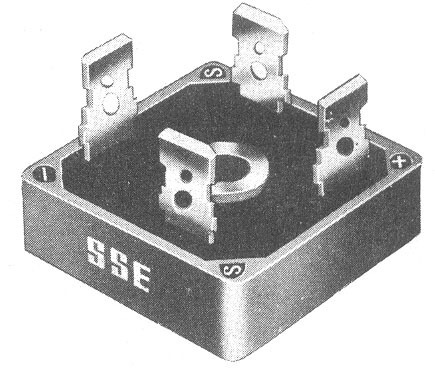 The first Power Semiconductor launched with the SSE Brand Name was a Silicon Controlled Rectifier (Thyristor) of 35 Amps RMS capacity in the TO-48 (TO-208AA) Stud Type Metal Package. In the coming months, TO-64, TO-39, TO-66, TO-3, TO-65 (TO-208AC), TO-103, TO-94, TO-93, TO-118 and 0.5 / 1.0 inch Hockey Puck Press Paks were gradually introduced. A few years later, around 1974 and thereafter, Triacs, in TO-39, TO-66, TO-3, TO-48 (TO-208AA), Diacs and Quadracs (Triac / Diac combination devices) were gradually introduced. These products gave SSE a sole monopoly in the Indian and Asian market (outside of Japan) which lasted for 14 long years. SSE shifted to Marol in the Suburbs of Mumbai City, very close to the city’s International Airport around mid 1977 and expanded its manufacturing activities to become the only Semiconductor factory in India exclusively engaged in the manufacture of Power Semiconductors. SSE received a registration of its Trademark in 1979. SSE began exports of its Power Semiconductors to West Europe, Korea and East European Countries in 1978. This was a time when India was still importing Power Semiconductors from the Western World. SSE has numerous firsts to its credit: All diffused SCRs, Invertors SCRs. Amplifying Gate SCRs, Sensitive Gate SCRs. Triacs, Sensitive Gate Logic Triacs, High Frequency Triacs, NPN & PNP Power Transistors and Darlingtons for low, medium and high frequency operation have been pioneered by SSE in India. Compact Modular Rectifier Bridges and Fast Recovery Rectifier Diodes were exported to many countries from 1979 on words. SSE make Standard and Fast Recovery Rectifiers & Bridges are the main stay of the heavy industry in India. Schottky Rectifiers, Fast Recovery, Ultra Fast Recovery and Super Fast Epitaxial Power Rectifiers in DO-4 (DO-203AA), DO-5 (DO-203AB), DO-8, DO-9 and Press Paks were introduced as early as in 1982. In 1988, SSE introduced a whole new line of low, and medium power Rectifier Bridges, Axial Diodes, Axial Schottky Rectifiers, Axial Fast Recovery Rectifiers and Bridges in P6, P3 (DO-203AA) KBPC and Metal Case Packages. A large majority of SSE Power Semiconductors carry International JEDEC / PROELECTRON type numbers with specification generally a little superior to these International Standards. Devices meeting military specifications (JSS list) are also available. Numerous Devices have been approved with CIL/LCSO/ERTL(W). In addition, to getting customer approvals, SSE has a modern testing facility in the factory and makes no compromises in the matters of Quality Control. All Devices undergo the strictest possible screening as enumerated in the latest Scientific Literature. Shipments are offer with guaranteed AQL of <2.5% and even <1% per lot. Most of the sophisticated Test Equipments as well as all production equipment has been manufactured on our own floor by our Engineers. This has been enabled SSE to stay on the leading edge of technology. SSE set up Diffusion facilities in 1972 and initiated Alloy Diffusion activities very successfully. SSE kept in step with the technological advances made all over the world and discontinued all obsolete processes immediately thereafter and in mid 1977 successfully launched the one step Diffusion process. Thus SSE apart from finished Power Semiconductors also offers Wafer, Diffused Chips and Sandwiches to its clients. People ridiculed the efforts made by SSE to build Semiconductors. But the hand of scientists and engineers worked relentlessly having implicit faith and determination. SSE MADE IT. India MADE IT. Since 1978, made in India / SSE MAKE COMPONENTS are available round the globe, in many instruments, machine and life serving equipments. In this process SSE developed a middle level technology suitable and adapted for Indian conditions. SSE has proved that small is beautiful. Thus, SSE is today in position to offer expertise to set up similar projects in India and developing countries. There is a strong and dynamic network of Authorized stockiest and General Dealers in over T wenty locations all over India. The customer list contains many blue chip OEMs and large public sector undertakings. In 2008 SSE launched a whole new Axial Fast, Ultra Fast & Schottky Rectifiers and Modular Single Phase Bridges, Center Tap Rectifiers, Doublers Rectifiers and Dual Diodes with Fast Recovery (200 nsec. and 100 nsec), Ultra Fast Recovery (50 nsec.) and Schottky Rectifiers (Zero Recovery). This is the first time in the world that such Fast Ultra Fast and Schottky Recovery Modular Rectifiers Bridges have been made available with Faston 6.4mm (1/4 inch) Terminals which make it easy to carry currents which PCB mounting Semiconductors and PCBs are incapable of carrying. Our 25 Amp to 35 Amp Modular Rectifier Bridges deliver 5.0 Amp to 8.0 Amp in free air without a heatsink. We also offer Fast and Standard Recovery Modular Bridges in 100 A, 150 A and 200 Amp Rating. Circuit designers have long awaited for reasonably priced Fast Recovery Modular Bridges to design Energy Efficient Rectifiers Equipment so that the need to mount high current TO-220 AB (TO-220) / TO-220 AC (TO3P) / TO-247AD / TO-264 AA Rectifiers on Printed Circuit Boards does not arise. ©1997-2016 Solid State Electronics Co. Pvt. Ltd., Mumbai, India. All Rights Reserved.